The Internet has set the pace for today’s revolution. It has turned brick and mortar businesses in eCommerce shops. It has made users shift to mobile apps and web applications to take care of their daily chores. Literally, every task is now done with the help of the Internet. Once upon a time, to be specific, two decades ago, this was not the case. The Internet was not freely available as it is today. It was never as fast as it is today. It never had the glam and shine that it boasts of today. The Internet was more of a military defense program that slowly developed into a full-blown commercial utility through continuous research. Commercial players also contributed to its growth with several business model inventions and innovations. The story of the Internet is quite an intriguing one indeed. We all ought to know about its story and its history to better appreciate the benefits that it is providing to us on a daily basis. 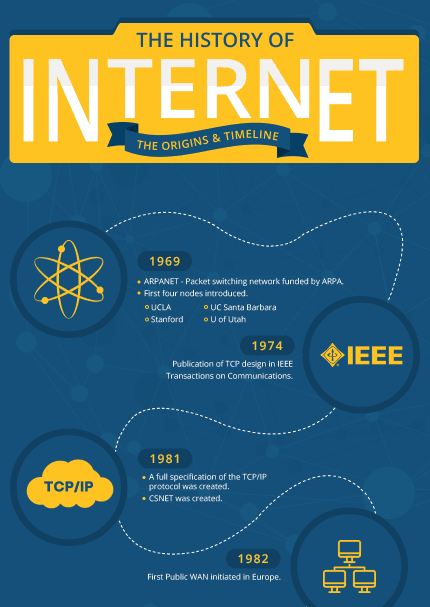 Here is an infographic developed by SSL2BUY that breaks down the history of the Internet into tiny chunks that you can easily digest. Throughout the length of the infographic, you will explore how the major online players of today have come into being and how it sparked a new digital revolution.